When shopping for a mortgage, whether it’s a new purchase-money mortgage or a refinance, knowing which loan type to pick and why is absolutely paramount. After all, the choice you make today will affect your checkbook for years to come. So it’s important to take your time and put care and research behind your decision. Yes, it will involve a mortgage calculator, notes, and most importantly, your precious time. We’re not shopping for a television here folks. We’re talking about one the biggest financial decisions of your life. When selecting an appropriate mortgage, it generally comes down to two main choices. Fixed or adjustable. A timeless mortgage question to be sure. Do you go with the relative safety of a 15- or 30-year fixed-rate mortgage, or do you try your luck with an adjustable-rate mortgage? Well, the answer depends on your unique financial position, the state of the economy, and your own individual risk appetite. If you’re the type that likes to play it safe, a fixed-rate mortgage is probably the best choice, hands down. With a FRM, you won’t have to worry about the interest rate changing at all throughout the life of the loan, which means you won’t ever see your monthly mortgage payment increase. This is certainly great peace of mind, but you do pay a bit of a price for it. Currently, mortgage rates on 30-year fixed loans are hovering around 4%, while 5/1 ARMs are pricing about a half point to a full percentage point lower. That brings us to adjustable-rate mortgages. These days, most ARMs are in fact hybrid ARMs, meaning they’re fixed for a certain period of time before becoming adjustable. One of the most popular ARMs is the 5/1 ARM, which is fixed for the first five years of the loan term, and adjustable for the remaining 25 years. This means you get five years of absolute certainty, followed by 25 years of the great unknown. Of course, you get a “discount” for taking on that risk, in the form of a lower mortgage rate. However, the big question is whether it’s worth it. Again, this depends on a number of factors. 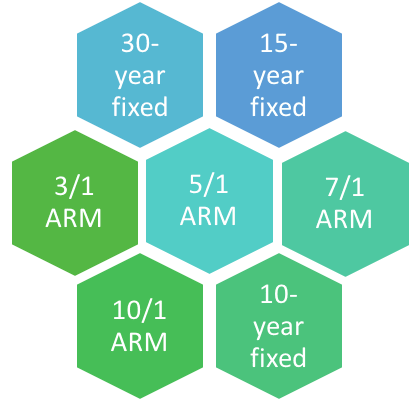 If you’re not quite convinced an ARM is for you, take a look at longer-term ARMs, such as the 7/1 and 10/1 ARM, which are fixed for seven and 10 years, respectively, before becoming annually adjustable. That way you get the best of both worlds. Fixed-rate or adjustable-rate mortgage aside, you’ll need to decide on a mortgage term as well. Below, I’ve highlighted some reasons why you’d maybe go one way or another. We have to consider personal risk appetite, tenure (how long you’ll keep the property), mortgage payoff goals, ability to refinance, and more. Simply put, a wealthier homeowner has more options, whereas someone who earns less may only be able to afford the 30-year fixed. And also won’t be able to take chances on an ARM. End of story. A 15-year fixed could be the best choice for conservative borrowers with deep pockets, especially if you want to pay off your mortgage early. The monthly payment will be significantly higher because of the shorter term, but you’ll pay a lot less in interest and own your home free and clear a lot sooner. If that’s what you’re looking for, it’s possible to take things a step further and make it a 10-year fixed too. There’s even a 15/15 ARM now, which is fixed for 15 years before adjusting just once at the halfway point. That could satisfy even the biggest ARM-hater. For the record, most homeowners move within six years, so many of these ARMs wouldn’t even make it to the first adjustment period before being paid off via a sale. But others might have their eyes on a forever home, with no interest in ever leaving or applying for another mortgage. So there’s no one-size-fits-all mortgage out there, it really depends on the individual. Want to Own More of Your Home Sooner? So there you have it – a primer on what mortgage you should pick and why. Remember, this is a huge financial decision, and should go well beyond reading one article. Sit down and compare all available options. Do the math. Do your homework. Make a plan. And SHOP AROUND! Read more: Do I qualify for a mortgage? There is some great reading and information on this website. I am in a rock and hardplace. A possibility of a 5/1 ARM with $1,000+appraisal costs @ 2.875 OR 7/1 ARM with no costs @ 3.125. No I do not plan to stay for 30 years. I am planning to move in a year or so. I have already been here 26 years and have refied a few times along the way. Wait until you have to buy out the spouse – everything starts all over – loan wise. I considered myself a 30-year fixed type of person, but now that rates have risen so much, I might become a 7-year ARM person. I guess it’s my alter ego. LOL. I’m a 15-year fixed person, but I also live in a state where home prices aren’t grossly inflated. For most people, a 30-year fixed is the only thing they can afford. Or worse, an ARM they can afford today but not tomorrow. It’s simple. If you are risk-averse and plan to stay in your home for a while, go fixed. If you are the opposite, go ARM. Done. That’s a good way of summing it up Frances, but each situation is unique and needs time and careful thought before making a decision. It also depends on rate spreads between different products at the time you take out the mortgage.